LISBON — Europe has a charming way of dropping you off in places you least expect. At least this was my experience when visiting a friend in Hamburg who bought me tickets to Lisbon while I was napping. Two things to note: true friendship comes in many forms and despite all its faults, RyanAir can at least boast cheap airfare. Now, Lisbon is not exactly a hotbed for American tourists. That is, not since Humphrey Bogart sent Ingrid Bergman there in Casablanca. It is, however, a unique and charming place for the American tourist looking for a vacation a little more adventurous than your Rome, Paris or London. Lisbon’s lack of American tourists is made up for by Europeans including many from Germany. Hamburg, Munich and Frankfurt all have non-stops to Lisbon with low cost carriers such as RyanAir, Vueling and Transavia. Traveling from the airport to downtown takes about 30 minutes and is easy by using the metro. Not to mention cheap! A full day pass is under €7. Despite being such an old city, Lisbon’s metro runs extensively through the city, but be sure to book a hostel or Airbnb near a metro, or you’ll quickly find yourself lost in a maze of curvy cobblestone sidewalks, colorful rowhomes and very, very long street names. For example, my guide’s home is on a street with six names, little of which I could pronounce. For this reason I would advise anyone traveling there to download a map of the city on his or her smartphone before leaving WiFi. The most popular, and perhaps most scenic, way to see the city is by tram, the most famous of which is Tram 28. Be sure to hail the tram at the Martin Moniz stop to ensure yourself a seat. Be prepared to wait in line, however. Not only is the tram itself both inspiring and nostalgic with its beautiful wooden interior and ability for climbing hills; it cruises through some of Lisbon’s most memorable sites! 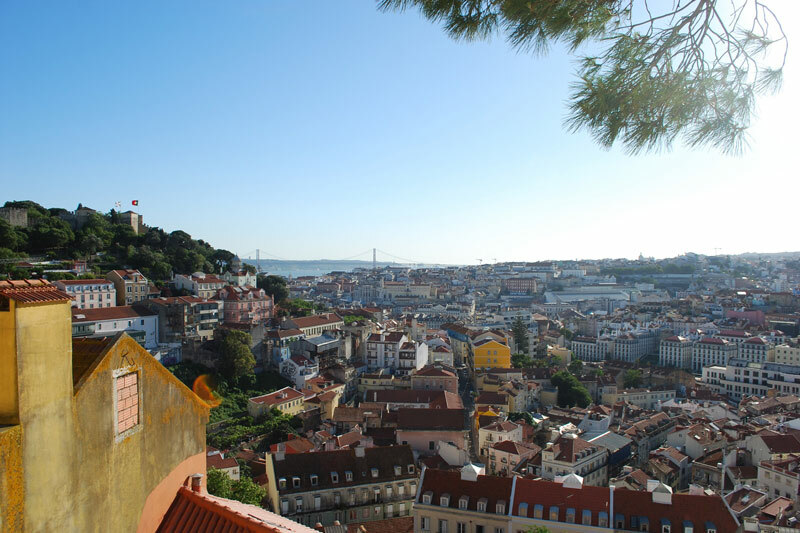 Lisbon is home to many hilltops with beautiful views called Miradouros: literally “viewpoints.” The two most famous viewpoints are accessible by Tram 28: Miradouro da Graça and Portas Sol. Both of these breathtaking viewpoints put you over the red tiled roofs of Lisbon yet give slightly different perspectives of the city and should not be missed. My favorite viewpoint, Miradouro Santa Catarina, is also accessible by Tram 28, and I encourage any sunset seekers to make time for it. Lisbon is also a historical city and the Portuguese are very proud of their culture. Calouste Gulbenkian Museum has a very impressive collection — enough to impress any tourist looking for Portuguese culture. The Jeronimos Monastery is a beautiful example of rich Portuguese architecture. One piece of advice: be wary of the Portuguese speaking staff, and be sure to only pay €5 for student or €10 for adult. The Belem Tower is only a short walk away for more breathtaking Portuguese architecture. Another must see. For those looking for a night out on the town, don’t expect Ibiza. But Urban Klub and Lux Club are right on the water, and both allow you to dance your night away. That is, if you can get in the bar. As with many places in Europe, these clubs love foreigners but sometimes for a heavy price. Those looking for a chill afternoon with a beer, go to Park. It’s a nice rooftop bar with a beautiful view of the city. It’s accessed by taking an unmarked garage elevator to the fifth floor, so it’s quite hidden — one of the charming things about the place. Although English is spoken by many young Portuguese, it is not by much of the population. As which much of Southern Europe, however, Lisboetas are warm people and are susceptible to a sheepish smile if English falls on Portuguese ears.